I want to build a combined diffused light and touch-button around 3x3cm. 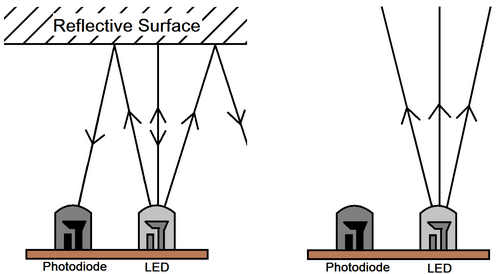 LEDs could be diffused with e.g. a polycarbonate sheet or diffusing fabric, and touch could be sensed e.g. through capacitive touch sensing. But how could I combine these two for the same button? I haven't been able to find a diffusing material that is also conductive, which (if I've understood correctly) would be necessary to use capacitive sensing. I could have a tiny copper lead in the middle of the button for touch sensing, but I'd like it to be possible to touch not just in the dead center, but on most of the button. put something transparent and conductive in front, (or just behind the front layer). Indium tin oxide is what they use to make touchscreens, but fine metal mesh would probably work almost as well. What if you wouldn't use capacitive sensing, but light sensing? 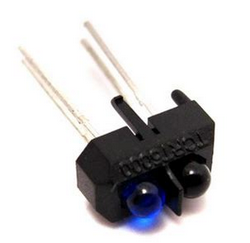 Use a photodiode to measure the reflected light from the LED. When someone touches the surface, the amount of reflected light will change and your switch is activated. You could use a pulse train pattern or some frequency to pulse the LED, and detect if something similar comes back at the sensor, to avoid false detections when somebody turns on the light in the room for instance. If the light in your button needs to be able to be on and off, maybe you can use something with a very high duty-cycle for ON, and a very low duty-cycle for OFF, or use a combination of IR light and your normal LED. Just to be clear: I've never build something like this, but it might work, and if it does, someone must have tried it before. Just trying to think along in a creative way :-). Not the answer you're looking for? Browse other questions tagged led touch-panel user-interface or ask your own question.